Malaya Watson traveled through the fire and ended up getting burned. The season's youngest contestant was voted off "American Idol" on Thursday (April 10) after her performance of Chaka Khan's "Through the Fire" on Wednesday's show. Watson's third visit to the bottom — Thursday only a Bottom 2 was revealed, not a Bottom 3 — proved to be her last as she was sent packing. The 16-year-old tuba player from Southfield, Michigan, teared up as her season's recap played on the studio's big screen, and she was choked up throughout her closing performance of the "Dreamgirls" song "I Am Changing." Watson was surrounded by her fellow contestants as she sang her final song, and most of them were males: Of the season's six eliminated contestants, five have been girls. The only ladies left as "Idol" moves to its Top 7 are Jena Irene and Jessica Meuse. For the third time in as many weeks, C.J. Harris also faced elimination, and he was again able to escape "Idol's" axe. He received good marks for his performance of Tom Petty's "Free Fallin'" on Wednesday, but his time seems to be running out. Going forward, Harris needs to loosen up and have a little fun on stage, as his lack of personality seems to be one of his shortcomings. Caleb Johnson has plenty to give -- maybe Harris can borrow some? Where's The Save When You Need It? The judges used up their one save for the season last week on Sam Woolf. But had it still been available, it seems reasonable that the judges would have used it on Watson on Thursday. 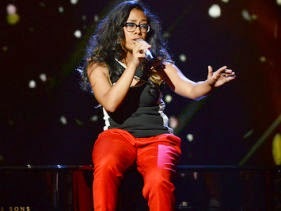 Watson had one of the competition's biggest voices and the most raw potential of any of the finalists. A save would have given her the swift kick she needed to channel that potential in the right direction, but alas, it wasn't meant to be. Next week, the "Idols" take on a new theme: Competitor's Pick. Each contestant will select one song for their fellow contestants to perform, and the contestants will have to choose a song from that pool without picking their own. Will anyone choose a song to purposely tank one of their fellow contestants? We can only hope!